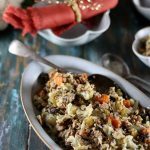 Forget the bread, use cauliflower florets to make the best low carb stuffing ever! Chop the carrots into thick slices. Chop the celery. Slice the mushrooms and onion. Mince the garlic. Chop your parsley, thyme and sage. Cut the cauliflower into small florets. As small as you can is better. In a large pot (I used a 7.25 quart/28cm/6.7L pot), add your butter and let it melt. Add the onions, carrots, celery and garlic to the pot and cook on low heat for about 15 minutes, or until the onions start to caramelize. At this point the carrots should be somewhat soft. Add the ground chicken and break apart while letting it cook. You don't want to have large chunks of meat inside your stuffing so it's important you break it apart as much as you can as it cooks. Add the mushrooms and spices and cook a couple more minutes until the mushrooms are soft. Add the cauliflower florets and cook for 3 minutes. Add the chicken bone broth, cover your pot with a lid and let steam for 3 minutes. Uncover the pot, and continue cooking for 5-10 minutes until the chicken broth has COMPLETELY evaporated. This is important as you don't want a wet cauliflower stuffing. When the broth has evaporated, your cauliflower stuffing is ready to serve!